We Go Look- Extra Money to Go Look! You are here: Home / Extra Cash / Misc / We Go Look- Extra Money to Go Look! 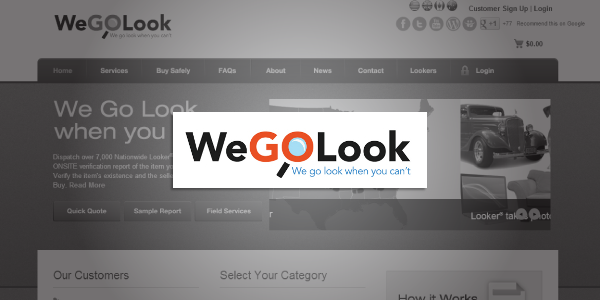 Wegolook.com provides a service to those needing to look at things that they cannot physically get to by completing Onsite Inspections. We go look hires “lookers” to perform these tasks for clients that request them. Clients can request that lookers look at anything they may need checked out. Clients and lookers never have contact with each other. • Can you send and receive text messages on your cell phone? • I want to be notified of jobs within _______miles of me. • Are you available full time? • Do you have a valid driver’s license? • Are you able to upload pics from your camera via the internet? You should also be prepared to fax, or scan and email, a completed W-9 form as well as give permission for a background check. They perform a background check on all of their lookers. There is an area on the application for noting criminal conviction and minor traffic offenses, and room to explain any that exist. Once you are accepted, you will get emails when jobs are posted in your area. You can also log in and check the job board at any time. Jobs go to the first looker that accepts them in the area. Once you accept a job, you go look at whatever it is they need you to look at, following the job directions. You many need to take pictures, or if something is for sale you may need to have the current owner demonstrate that it works. You are to try to go look at the object within 4 hours of accepting the job, and continue trying during business hours until contact is made. You are also to make every effort to perform the observation within 48 consecutive hours, not business hours, of accepting the job. The report and any pictures must be uploaded to the website within 8 hours of completing the observation. Jobs pay $25 and up, and the rate is noted beside each job on the job board. There is no reimbursement for gas, mileage, or other expenses. Payment is made via PayPal within 30 days of completing the job, and they retain the right to withhold payment if the job was not completed correctly. The most recent chatter out there seems to point to this being a real, legitimate way to make some money. Those who have done jobs for them have been paid on time and note that they are easy to work with and readily answer questions. The drawback seems to be that a lot of people have applied and have not heard back or they have been accepted but there are not any jobs available in their area. That being said, the conclusion seems to be that this is a fun, legitimate egg to have in your basket. There is, however, no guarantee of jobs being available in your area at all, let alone consistently. If you are interested, apply and hope that you get the chance to make some extra cash some time soon. Go Find a Real Job! -I’m Ranting!! 10 Places We Love to Make Money Online! Very interesting type of work. It sounds like it could be a lot of fun too. Chalk it up for a “task sort” of job for extra money!